I AM SO MAD RIGHT NOW!!! I know this is my second post of the day but this is just disgraceful! I love Harry Potter. I love Gryffindor. 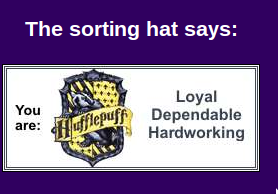 THE SORTING HAT JUST PUT ME IN HUFFLEPUFF!!!! Why? WHY? I am a true Gryfindor!!!! I did it like 20 times all HUFFLEPUFF!!!! I am a gryfindor!!! A HARRY POTTER! A HERMIONE GRANGER!!!! A RON WEASLEY!!! A GINNY! A FRED! A GEORGE! A GODRIC GRYFINDOR!! A DUMBLEDORE! A HAGRID!! EVERYONE I AM A GRYFINDOR!!!! NOT A HELGA HUFFLEPUFF OR A CEDRIC DIGGORY (Although Cedric is pretty swag) NOT A HUFFLEPUFF!!!!!! !